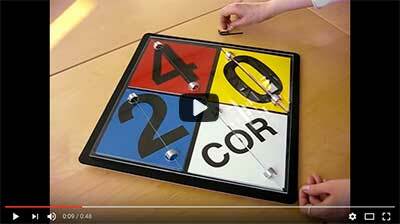 NFPA 704 is a labeling system used to identify hazardous materials. It is published by the National Fire Protection Association (NFPA). NFPA 704 is a supplemental labeling system specifically intended for emergency responders, though other people can read and benefit from these labels in normal working conditions. Most people have seen these types of labels, as the diamond shape with colors and numbers on the label is easily recognizable. These labels can be used on any type of chemical container to alert people to the specific hazards present. Emergency responders such as paramedics, police officers, firemen, and others are typically trained to read these labels and understand them quickly. At a glance, an emergency responder can recognize that, for example, they will need to wear respiratory protection when entering an area where the chemicals have been spilled. 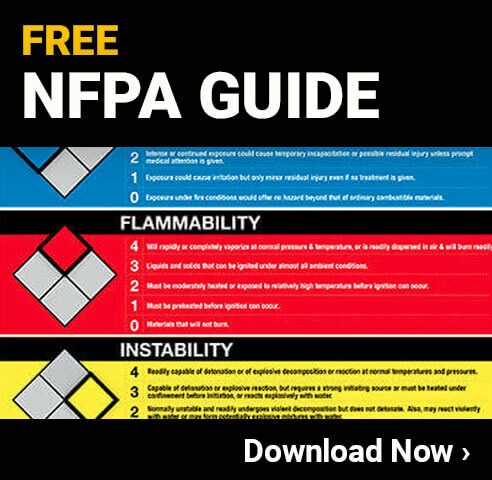 The NFPA 704 label contains lots of information in a compact and easy-to-understand format, which is essential in emergency situations. The most recognizable part of the label is the diamond, which is further broken up into four smaller diamonds. Each of the diamonds is color-coded and represents a different type of hazard. Within the diamond is a number (with the exception of the white diamond). The number corresponds to the level of danger a chemical poses. The lower the number, the lower the hazard. The numbers range from zero to four, with zero representing no hazard at all, and four representing an extreme hazard. Each number also has a specific meaning based on which diamond it is in. The small diamond on the left side of the larger diamond has a blue background and is used to alert people to health hazards. Health hazards can include skin reactions, diseases such as cancer, respiratory issues, or any number of other health related issues. The higher the number, the more precautions someone should take when working with the chemical, and the more protective equipment needs to be used when dealing with an emergency. Zero - Chemicals in this level pose no health hazard and there is no precaution necessary. Chemicals like water and others that are entirely safe under normal use can be labeled with a zero in this category. One - Level one for the health hazard category is for any chemical that can only cause a mild reaction or injury due to exposure. In most situations, no extra personal protective equipment is needed beyond perhaps gloves. Two - Level two is for chemicals that can cause temporary incapacitation or residual injury, but only if there is intense or prolonged exposure to the chemical. Threee - This level is for chemicals that can cause either a temporary or a moderate residual injury when there is even a short exposure period. Four - Level four chemicals can cause serious injury or death with even brief or limited exposure. Extreme precaution is necessary at this level. Personal protective equipment needs to be worn before working with this chemical or even the container that holds it. This is especially true during an emergency such as a chemical spill. The top diamond has a red background and lets people know whether the chemical being labeled is flammable. Chemicals that cannot burn will have a zero in this diamond, and those that are extremely flammable will have a four. Most chemicals will have a rating somewhere in between. If a fireman responding to an emergency sees that a chemical barrel has a flammability level above zero, they will immediately know they need to take precautions to keep sparks, flames, or heat away from that chemical. Zero - Any label that has a zero in this diamond is a material that will not burn, even in typical fire conditions. The specific standards followed for this level state that this is for materials that will not burn while in the air and exposed to a temperature of 1500 F for five minutes. One - Any material or chemical that will burn, but only when heated significantly. These materials must have a flash point of 200 F or higher. Two - Any material or chemical that needs to be exposed to a "relatively" high temperature before it will ignite. Flash points between 100 and 200 F are in this level. Threee - Any material or chemical that can ignite under most ambient temperatures and has a flash point below 73 F, and also has a boiling point of at least 100 F.
Four - Items found in this category will readily burn and have a flash point that is below normal room temperatures (73 degrees). These are the most dangerous and include chemicals like acetylene and propane. The right diamond has a yellow background and lets people know how stabile the chemical is. Stability refers to how easily the chemical can change or have some type of reaction. Highly unstable chemicals can react from something as simple as being exposed to air or being shaken. This particular box on the label does not provide any information about what causes the chemical to be unstable. Emergency responders will need to look further on the label to learn this, and if chemicals are unable, responders should take extreme precaution to avoid any type of reaction. Zero - Any chemical that is normally very stable and won's react even under conditions such as fire or immersion in water. One - This level is for chemicals that are stable in most situations, but when temperatures or pressures are elevated significantly, they can become unstable. Two - Chemicals with this level can have a violent chemical change when exposed to elevated pressures or temperatures. In addition, they may have serious reactions when exposed to water. Threee - Any chemical that can explode or detonate after an initiation or when exposed to heat. This type of chemical may also have a serious reaction to water or a shock. Four - Chemicals at this level can react or detonate even at normal pressures and temperatures. They need to be kept in a very well regulated environment at all times to ensure a dangerous reaction doesn's occur. The white diamond, which is at the bottom, does not contain a number like the others because it does not list the severity of a particular type of hazard. Instead, this diamond contains symbols that convey special precautions or hazards that exist. W - The W symbol indicates that the chemical being labeled has a strong reaction to water. Chemicals like potassium, magnesium, rubidium, and cesium that will explode, burn, or give off dangerous gases when exposed to water have this symbol. This is an important warning to firemen and other emergency responders not to use water on or around this chemical. OX - This symbol indicates that the chemical will have a violent reaction if exposed to oxygen. 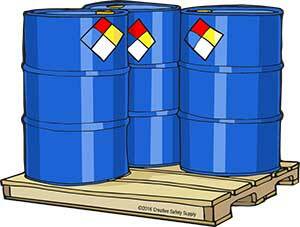 Strong oxidizers like ammonium nitrate, ketone peroxides, bromates, and chromates should be labeled with this symbol so the container is not opened or punctured. SA - SA is a symbol for simple asphyxiate gases. These gases reduce or displace the oxygen in the area, which can be extremely dangerous for people nearby, as they could suffocate from having no access to oxygen. Chemicals that can cause this reaction include nitrogen, helium, neon, and argon. COR, ACID, ALK - These symbols are used for any chemical that is corrosive, including strong acids and bases. BIO - Any chemical that presents a biological hazard may be labeled with this symbol. POI - All poisonous chemicals fall under this symbol. RA or RAD - Any radioactive chemicals can be labeled with this symbol. CRY or CRYO - Cryogenic chemicals may have this symbol listed in the white diamond. Unlike many other labeling systems, the NFPA 704 system is not required. The NFPA is not a governmental agency and it has no specific enforcement powers. Companies and individuals use this system because it is effective and can dramatically improve the safety of many environments. People will notice this type of label in a wide range of areas. 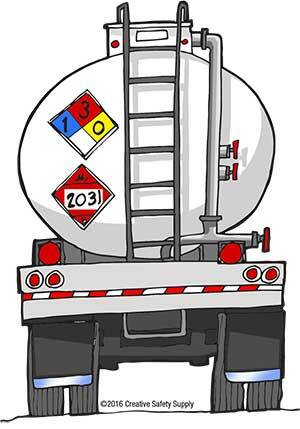 One of the most common places the average person will see an NFPA 704 label is on trucks that carry chemicals. These trucks often have these labels on the back so emergency responders are aware of the danger should the truck get in an accident. In most cases, the label will be physically attached to the truck and made of metal. The truck driver can move the label around to change the numbers in the diamonds, which makes it a flexible option that can be used for any type of chemical. This type of labeling is used in a wide range of industries. In many cases, companies will order chemicals for cleaning or other activities, and the chemicals will have these labels on them from the manufacturer or the retailer. In other cases, the company will order large quantities of chemicals and then print off their own labels to meet their own internal standards. Even if they don's know it, most companies and organizations have these labels on the chemicals they use. Areas where this type of labeling is commonly found include warehouses, manufacturing facilities, schools, construction sites, retail stores, warehouses, and gas stations. The NFPA identifies this labeling system as supplementary, which means it can be used along with other label systems. OSHA specifically says these labels can be used along with the other requirements laid out in its HazCom 2012 standards. This is important because OSHA requirements are often required by law, so having supplemental labels approved is essential. Whenever using multiple labels on a chemical container, it is important to ensure they are sized and positioned properly so that all the labels are easy to read. Having them too close together can sometimes make them seem like one label. This is one of the reasons some companies use their own industrial label printers so they can have the exact size and type of labels they need for their own internal safety standards. It is also important to note that the NFPA standards have been incorporated into some OSHA standards. In these situations, the NFPA standards are required to be followed by law. 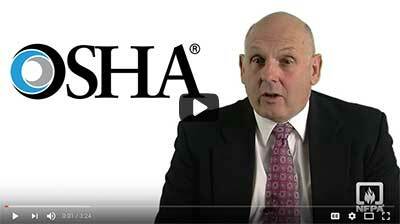 Even though OSHA is the agency enforcing these requirements, the data and usage information is often provided by NFPA.